It was a hot humid afternoon offset by a brilliant cloudless blue sky. In a large inner courtyard of the colossal S.A.R.M. House, heaps of vegetables were being cut and peeled deftly by a group of men and women. Several ladies draped in vibrant heavy silk saris were bustling about issuing intermittent orders to the bevy of servants. 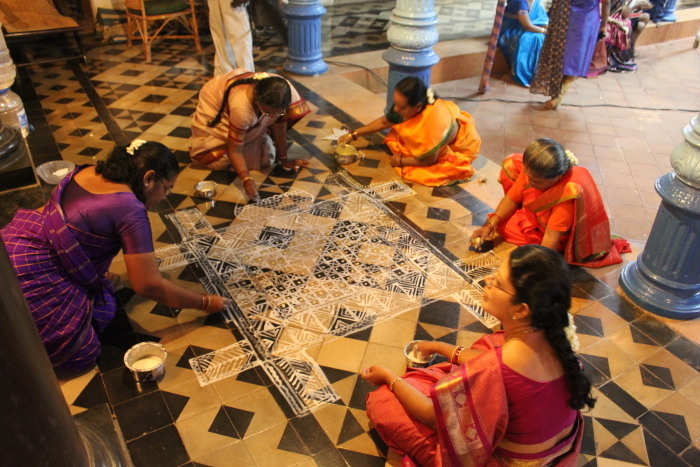 Another group was clustered around the doorway, laughing and drawing an elaborate kolam (floor pattern) using rice flour paste. We could not believe our luck. We had landed in Kanadukathan rather serendipitously and strolled into Chettinadu Mansion, a heritage B&B run by Mr. Chandramouli on the eve of his grand-daughter’s wedding. When the family discovered that we were curious travel writers, they promptly invited us to be part of a full-blown Chettiar wedding. 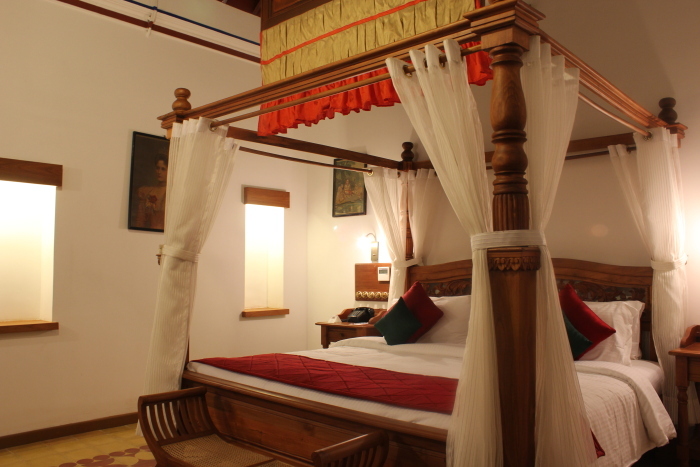 We couldn’t have asked for a better way to experience Chettinad’s distinctive culture and lifestyle. How the Nagarathars, an industrious Tamil trading community carved an oasis of immense enviable wealth and prosperity in the barren dust bowl of central Tamil Nadu, is the stuff dreams are made of. As ship chandlers of the Cholas, the Chettiars traded rice from the Kaveri delta and salt from the Coromandel Coast and followed trade routes to far lands. After the destruction of their settlement at Kaveripoompattinam or Poompuhar by a tsunami, the Chettiars migrated inland in the 8th century. Legend has it that their paranoia about water compelled them to seek refuge in a land-locked region and build their mansions on an elevated patch. They settled in this arid hinterland in four villages around Ilyathangudi, 25 km west of Karaikudi. The Pandya kings granted them nine temples, around which the first clans grew and eventually spread to 96 settlements in a 600 square mile area between Pudukottai and Sivaganga. The Chettiars rebuilt their fortunes and became moneylenders to farmers, zamindars, chieftains and kings alike. Their good relations with the Rajas of Pudukottai, Sivaganga and Ramanathapuram brought them to the attention of the East India Company. British expansionism led them to Ceylon in 1796 and Burma in 1824. Their business acumen helped them expand their trade to Mauritius, Africa and the Far East. Wielding tremendous economic power they helped finance and create entire countries! 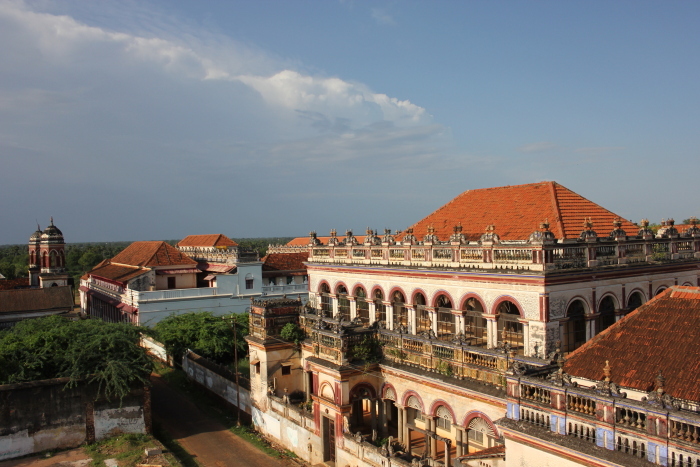 They returned in 19th and 20th century and erected grand mansions or Nattu-kottai (fortresses on land) with their acquired fortune. As moneylenders, Chettiars provided every possible service offered by a modern bank. Between 1875 and 1925, they practically controlled the Indian economy and even discounted excess sterling bills for rupee bills. As masters of town-planning, they built wide streets and ingeniously harvested rainwater through eri (reservoirs) and urani (tanks). However, World War II and political upheavals across the Far East forced many Chettiars to return bankrupt; some had to sell off their homes bit by bit in order to survive. Today, several palatial dwellings have been converted into heritage homestays and boutique hotels. Sprawled over 40,000 sq ft, the century-old Chettinadu Mansion was bustling with activity as guests milled about its succession of courtyards. The marriage procession entered with much fanfare. It seemed as if Kanadukathan’s quiet streets had been biding time for far-flung families to come together to celebrate occasions like this. The home rang with voices and laughter as stories of past grandeur and family anecdotes echoed down the halls. After the ceremony, we found ourselves willingly whisked into an inner courtyard for the kalyan sappad or traditional wedding feast, a vegetarian affair. Meals were being served on banana leaf, the tip pointing left. Every dish had a designated space and was served in a particular sequence. Starting from the top left, salt, pickle and mor milagai (chili dipped in salty yoghurt and fried) were served, followed by varuval (dry dish), kootu (lentil curry), urundai (fried lentil balls), cabbage poriyal (side dish) and masiyal (mash) of potato, which can be replaced by keerai (spinach) or senai kilangu (yam). Fries like papad and vadai were placed at the bottom left while chapatti and a barrage of rice dishes occupied the centre. White rice paired with sambar and rasam, was followed by lemon rice, vegetable pulav and kuzhambu (gravy) with the final clincher, curd rice! The bottom right was reserved for sweets – traditional halwa and payasam. The Chettiars also picked up global flavours on their travels; kavuni arisi (black sticky rice pudding) is a Burmese influence while rhubarb cheesecake is a colonial inspiration. For years, traditional set-samayalkarar (team of cooks) honed their skills under the watchful eyes of aachis (elderly ladies of the house) and became sought after caterers at Chettiar functions. Eventually, they would move out to other cities to set up their own restaurants, leading to culinary mascots like Chicken Chettinad. Today, eateries dot every city in South India and faraway lands like Canada, US and the Far East. The aachi seated beside us pooh-poohed these so-called ‘authentic’ Chettinad restaurants. “Unless masalas are prepared in stone grinders, vegetables cut with an aruamanai (iron blade) and particular firewood used to cook specific dishes, it is not authentic Chettinad!” she exclaimed. In an inhospitable terrain where little grew, Chettiars had extended their repertoire to wild game like kada (quail), muyal (rabbit), pura (pigeon) and pitta (turkey). Chettinad samayal (cooking) also included a range of sun-dried meats and salted vegetables. Despite its inland location, Chettinad cuisine accommodates a lot of seafood, perhaps hinting at their earlier proximity to the sea. Dishes like nandu (crab) masala, sora puttu (shark curry), eral (prawn) masala, meen kuzhambu (fish curry), vaalai yaley meen (banana wrap fish) and Masala Fish Fry are legendary. The next morning, in the shade of a creeper-filled verandah we were treated to a lavish breakfast of soft idlis, dosai and vadai with assorted chutneys. 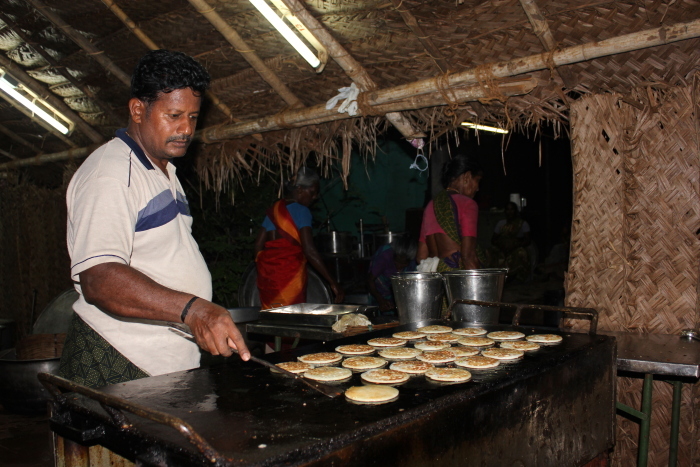 Other typical preparations are appam, idiappam (string hoppers) and kozha kattai (steamed rice dumplings); one sweet with sesame and jaggery, the other salted with lentil, coriander and grated coconut. Like lobsters being emptied out onto the deck of a trawler, we stepped out into the wide streets of Kanadukathan in the late afternoon sun. Thankfully, the 110-year-old Raja’s Palace was just a lane away. 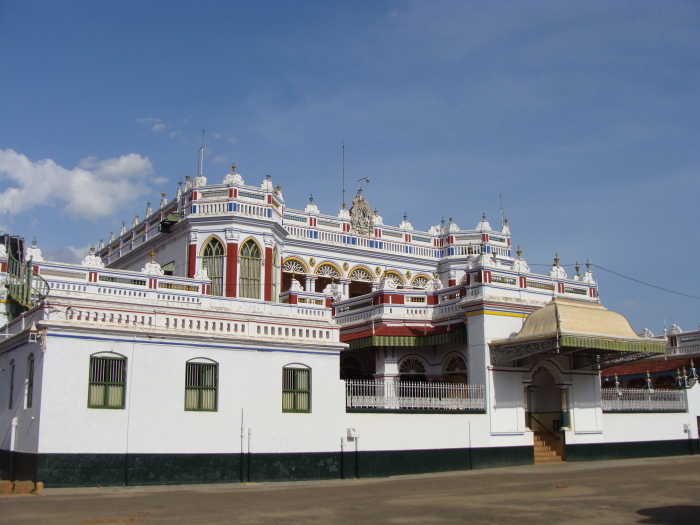 The massive residence belonged to Chettinad’s most famous luminary Dr. S.Rm.M. Annamalai Chettiar, founder of the Indian Bank and Annamalai University. For his philanthropic efforts, he was made Diwan Bahadur, conferred with knighthood and given the hereditary title of Rajah of Chettinad by the King of England in 1929. Mighty 8 ft long ivory tusks shipped from South Africa bracketed his huge portrait in the meeting hall which led to a series of inner courtyards. The Kanadukathan Railway Station even has a covered walkway leading to a royal waiting room specially designed for him, complete with plush duvets and a bidet. A short detour led us to Saratha Vilas in Kothamangalam, where a Chettiar merchant’s home had been lovingly restored by two French architects. Michel Adment and Bernard Dragon ushered us into the white-washed bungalow where the chandeliers in the hall caught the evening sun in a dazzling burst of light. Old sakarapattis (sugar granaries) adorned the rooms while idli grindstones served as sinks. The inner courtyard led to Ayurvedic massage rooms and a garden at the back. Over an interesting spread of Franco-Tamil cuisine, we consumed pasta, rice, sambar and vegetables and learnt about the restoration process. The French duo even conducted architecture and culture tours. By night, we returned to our base at Kanadukathan. 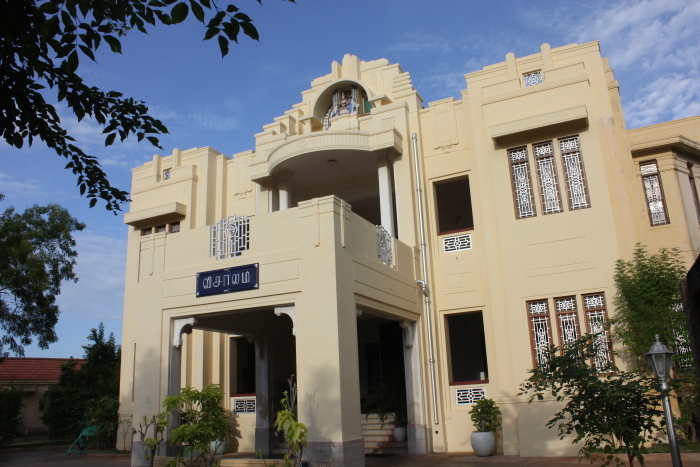 Visalam was an Art Deco building converted into a stunning heritage hotel by CGH Earth. The mansion was a father’s gift for his daughter Visalakshi, which gave the property its name. Black and white family photographs adorned the walls offering nostalgic glimpses of the old days. It was a happy coincidence to meet the original owners, who had dropped in for dinner. There were three different dining areas allocated for each meal. A separate lounge area with antique posters overlooked the pool. The interactive kitchen displayed large brass vessels and neatly labeled containers of dry masalas and exotic spices like marathi mokku (dried flower pods), anasipoo (star aniseed) and kalpasi (black stone flower, a lichen). We visited the small village of Athangudi, known for its famous handcrafted decorative floor tiles. Small-scale factories churned out stacks of vibrant tiles or poo kallu (floral stones) in geometric designs. Black and white motifs and borders were a Chettinad specialty. At Ganapathy Tile Factory we were obliged with a live demo of the fascinating tile-making process that had been perfected over a hundred years. Unlike mass-produced ceramic tiles, Athangudi tiles are cast by hand using local sand, fine gravel and cement. At Athangudi Palace or Letchmi Vilas, we were subjected to what was fast becoming a farcical ritual in Chettinad – the Key Show. House owners or caretakers derived some untold joy in showing off the gigantic keys used to lock the massive teak doors! 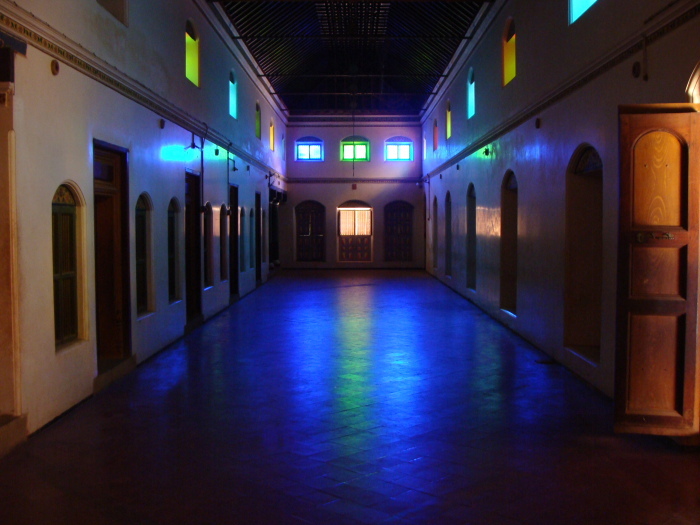 At Karaikudi we made a brief stop at Aayiram Jannal or the House with a Thousand Windows. We had just finished counting till 37, when a kind passerby shook his head and said ‘Don’t bother! I think it has 900 and something odd windows. 1000 is just for convenience!’ We thanked him profusely for his timely interruption and continued to The Bangala, an elegant colonial family home built in 1910. Dark polished wood and period furniture perfectly contrasted the spotless white walls. Mrs. Meyyappan, the grande dame running the show was a walking encyclopedia on all things Chettinad. After all, she had co-authored the wonderful tome ‘The Chettiar Heritage’, which was on sale at The Bangala shop. She regaled us with anecdotes of how The Bangala used to be a fashionable venue for tea parties and tennis tournaments for VIPs. “The Governor of Madras, Sir Arthur Hope, was a houseguest in the 1940s and the furniture, cutlery and crockery graced by him are still in use” she added. 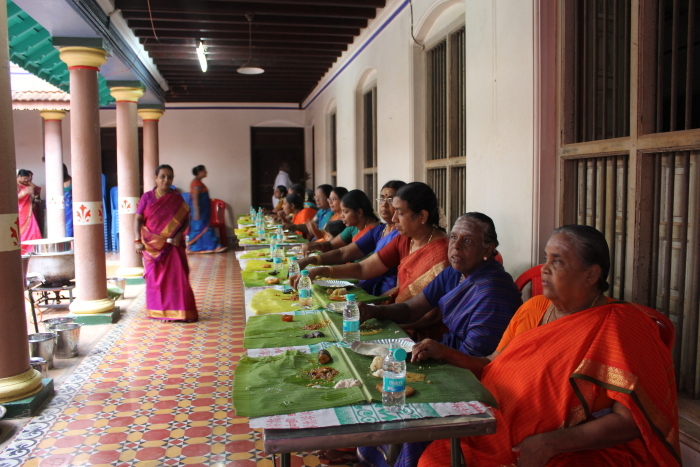 Visitors can enjoy Chettinad meals served on banana leaves with cooking demos and kitchen tours. Yet every house however unique, paled in comparison to the opulence of Chidambara Vilas. The road from Karaikudi headed north to Tirumayam Fort, built by the Sethupati kings of Ramanad in 1687. 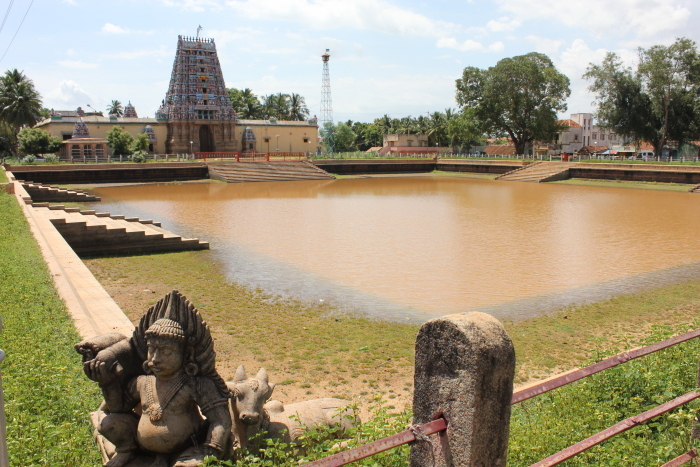 Originally built in seven concentric rings around a massive rock, the fort had two rock-cut temples of Shiva and Vishnu and a temple tank on the south side. After a brief stop, we soon continued to Kadiapatti to check out Chettinad’s latest and most premium heritage hotel. The 107-year-old building was formerly the residence of TS Krishnappa Chettiar and had been painstakingly renovated by the Sangam Group. 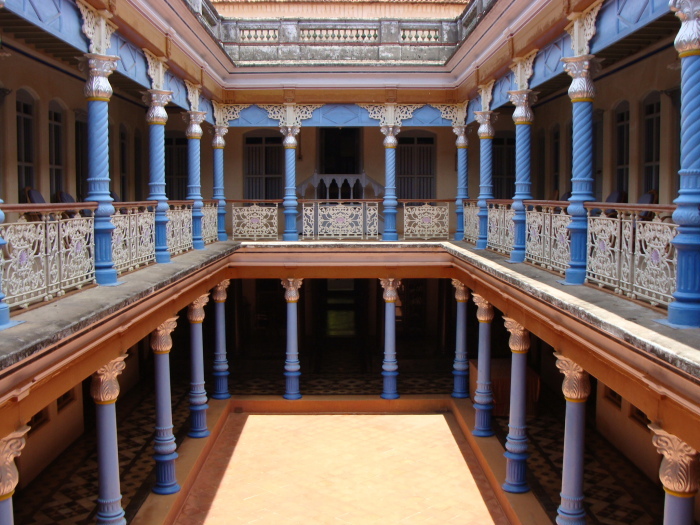 Accessible by a massive, exquisitely carved doorway, its inner courtyards were lined by pillars made of gleaming teak, rosewood and granite while the old Bomma kottai (Hall of Dolls) had been converted into a restaurant. Beyond the maze of halls, was a stunning swimming pool, deck and spa. A staircase led to the terrace, which commanded a fantastic view of neighbouring mansions. Being affluent and widely travelled, the Chettiars often competed with each other, using their homes as a style statement. The posh interiors were done up in Burma Teak, Ceylon satinwood, Italian Marble, Swedish enamelware, Belgian chandeliers, English crockery and Japanese ceramic tiles. Paintings and murals of Hindu deities, British soldiers, Victorian women and scenes from the Raj adorned the walls and exterior. 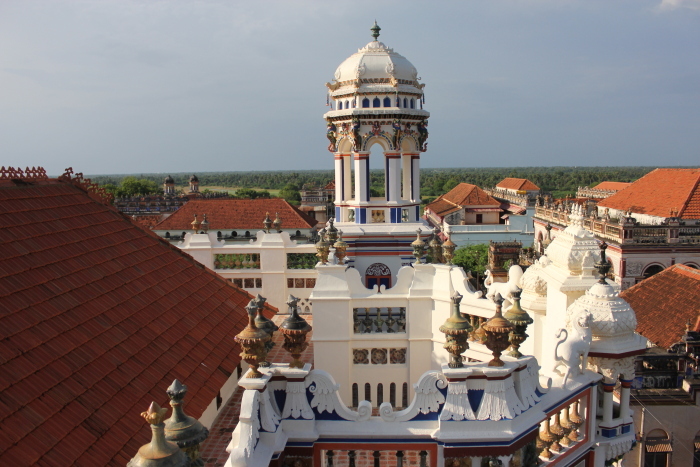 Chidambara Vilas was the perfect specimen to comprehend the opulence of Chettiar architecture. We were lucky to visit most of the nine clan temples of the Chettiars at Surakkudi, Nemam, Iraniyur, Velangudi, Mathur and Vairavanpatti. However, the most important shrine was the Karpaga Vinayakar Temple at Pillaiyarpatti (13 km NW of Karaikudi). The gleaming black idol of Valampuri Vinayakar with a gilded trunk curled to the right is supposed to have manifested itself from the cliffs. Chettinad held many such surprises – cave paintings at Sittanavasal and Narthamalai, Tamil Nadu’s second largest museum at Pudukkottai and the Ayyanar shrines dedicated to village deities with offerings of terracotta horses. For a relatively small region, it was astonishing to see the widespread impact of Chettinad across cuisine, architecture, philanthropy, education and hospitality. However, what overshadowed everything was the utter humility of its people whose hearts were larger than their homes.